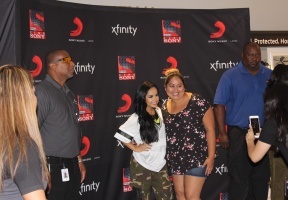 Singer, songwriter, and actress extraordinaire Becky G created pandemonium in Joliet on Saturday, Aug. 11th where she greeted fervent fans who waited in line for hours in the scorching heat. 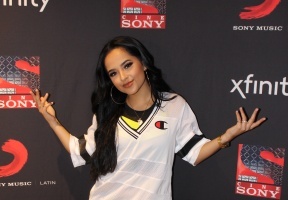 “Girl, it means so much to me to have my fans here, my fans who have supported me all these years,” said Becky G in an in-person interview with Lawndale Bilingual News. 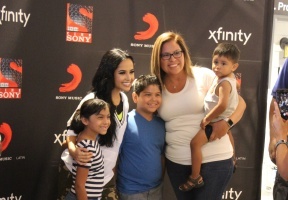 “I am so happy to be here and thank them for all their love and support.” Becky G greeted families who traveled from all over the Chicagoland to catch a glimpse of the artist at the Xfinity Store in Louis Joliet Pointe Shopping Center. Attendees got to experience all of the newest products and features that the Xfinity Store has to offer. Becky G is currently promoting her hit single “Sin Pijama” which features the participation of singer Natti Natasha, has been #1 in Spain for five weeks in a row and top 10 on Billboard’s Latin Airplay and Hot Latin Songs charts for several weeks (#6 currently on both charts). “My album has a bit of everything because growing up in Inglewood, California I was surrounded by all kinds of music from Reggaeton, Hip-Hop, Rap, Soul, Salsa…so I have a mixture of sounds that is for everyone. 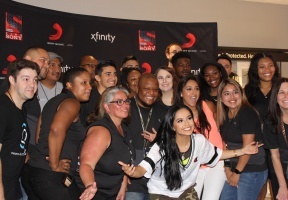 It’s a fun album and I enjoyed making it.” Becky G can next be seen in this summer’s family adventure, A.X.L., about a down-on-his-luck teenage bike rider that forms an emotional bond with an advanced, robotic, military dog named A.X.L. Inspired by the ‘80s classic, Short Circuit, A.X.L. hits theaters on August 24th.